O Glorious St. Raphael, Patron and Lover of the Young, I call upon thee and plead with thee for thy help. In all confidence I open my heart to thee, to beg thy guidance and assistance in the important task of planning my future. Obtain for me through thy intercession the light of God’s grace, so that I may decide wisely concerning the person who is to be my partner through life. O Angel of Happy Meetings, lead us by the hand to find each other. May all our movements be guided by thy light and transfigured by thy joy. As thou didst lead the young Tobias to Sara and opened up for him a new life of happiness with her in holy marriage, lead me to such a one whom in thine angelic wisdom thou dost judge best suited to be united with me in marriage. St. Raphael, loving patron of those seeking a marriage partner, help me in this supreme decision of my life. Find for me as a helpmate in life that person whose character will reflect the traits of Jesus and Mary. May he(she) be upright, loyal, pure, sincere and noble, so that with united efforts and with chaste and unselfish love, we both may strive to perfect ourselves in soul and body, as well as the children it may please God to entrust to our care. St. Raphael, Angel of chaste courtship, bless our friendship and our love, that sin may have no part in it. May our mutual love bind us so closely that our future home may ever be most like the home of the Holy Family of Nazareth. Offer thy prayers to God for both of us and obtain the blessing of God upon our marriage, as thou wert the herald of blessing for the marriage of Tobias and Sara. St. Raphael, friend of the young, be thou my friend, for I shall always be thine. I desire to ever invoke thee in my needs. To thy special care I entrust the decision I am to make as to my future wife (husband). Direct me to the person with whom I can best cooperate in doing God’s Holy Will, with whom I can live in peace, love and harmony in this life and attain eternal joy in the next. Amen. How would you like to join a group of single folks of all ages for for a live prayer to St Raphael for a Spouse? Parents of adult children of marriageable age are welcome too! At Chaste Courtship, we believe in not only praying and waiting on the Lord, but also taking action. St Augustine (some say Ignatius of Loyola), said “Pray as if it all depended on God. Act as if it all depended on you”. And so, let’s do our part and God will do his part. St Raphael the Archangel is found in the book of Tobit. 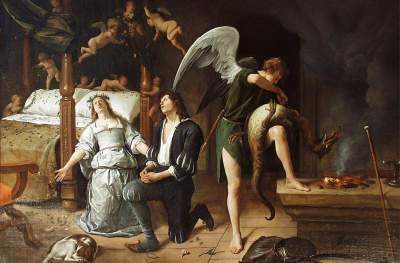 To read about Tobit and Sarah, more in detail, check out the book of Tobit. We will be praying three prayers. Where Will the Prayers Take Place? The Prayers will be on the Chaste Courtship Facebook Page. What Time Will These Prayers Take Place? Ever at Human Sorrow’s side. a Hail Marys to Mary, Queen of Angels. Glory be to the Father; Glory be to the Son; Glory be to the Holy Spirit. Concluding Aspiration: St Raphael, Angel of health, of love, of joy and light, pray for us! If you missed this live prayer, don’t worry. I will post the video right in this thread within a week of the live prayer. Looking forward to praying with you. God bless! Have you ever considered praying for your future spouse? Yes, I mean have you yet prayed for the man or woman that you have yet to meet. Sounds a bit crazy doesn’t it? Well, let me give you three reasons why you should pray for your future spouse. Marriage involves sacrifice. Sometimes you have to deny your own needs in order for the marriage to work. Women sacrifice their wills by submitting to their husbands. Men are called to sacrifice and love their wives as Christ loved the Church. Might as well get used to it now! One of the purposes of marriage is to help your spouse get to heaven. Why not start praying for the salvation of your future spouse’s soul even now? • Pray that God helps your spouse to stay in a state of grace. I read somewhere about a man who had prayed for his future spouse. Years after he had married his spouse, he was looking through his journal and found the entries where he was praying for his spouse. Out of curiosity, he asked her what she had been doing at the time. Apparently, the young woman had been rebelling against God. It was a time of spiritual darkness for her, but somehow she was delivered from that lifestyle. Who is to say the her husband’s prayers did not aid her in her conversion? Choosing a spouse is a very grave responsibility and one that should not be done without God. Shouldn’t God be involved in something so amazing as your sacramental marriage? Also, when you invite God into your decision making, you will have more of an open mind when your actual spouse crosses your path. I hope these three reasons show you why you should pray for your spouse. Scripture tells us that we should pray without ceasing. We have a myriad of prayer requests. Why not pray for something as important as finding a spouse? Mother Teresa: I used to believe prayer changes things, but now I know prayer changes us and we change things. So let’s go out there and change things! Check out this talk I did on praying for your spouse.